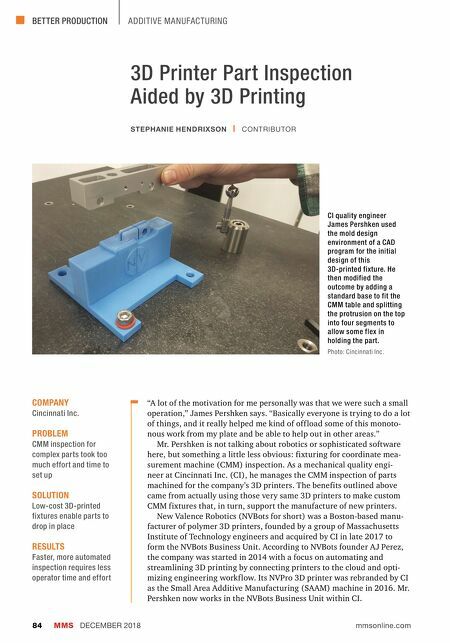 BETTER PRODUCTION MMS DECEMBER 2018 84 mmsonline.com ADDITIVE MANUFACTURING 3D Printer Part Inspection Aided by 3D Printing "A lot of the motivation for me personally was that we were such a small operation," James Pershken says. "Basically everyone is trying to do a lot of things, and it really helped me kind of off load some of this monoto- nous work from my plate and be able to help out in other areas." Mr. Pershken is not talking about robotics or sophisticated software here, but something a little less obvious: fixturing for coordinate mea- surement machine (CMM) inspection. As a mechanical quality engi- neer at Cincinnati Inc. (CI), he manages the CMM inspection of parts machined for the company's 3D printers. The benefits outlined above came from actually using those very same 3D printers to make custom CMM fixtures that, in turn, support the manufacture of new printers. New Valence Robotics (NVBots for short) was a Boston-based manu- facturer of polymer 3D printers, founded by a group of Massachusetts Institute of Technology engineers and acquired by CI in late 2017 to form the NVBots Business Unit. According to NVBots founder AJ Perez, the company was started in 2014 with a focus on automating and streamlining 3D printing by connecting printers to the cloud and opti- mizing engineering workf low. Its NVPro 3D printer was rebranded by CI as the Small Area Additive Manufacturing (SAAM) machine in 2016. Mr. Pershken now works in the NVBots Business Unit within CI. COMPANY Cincinnati Inc. 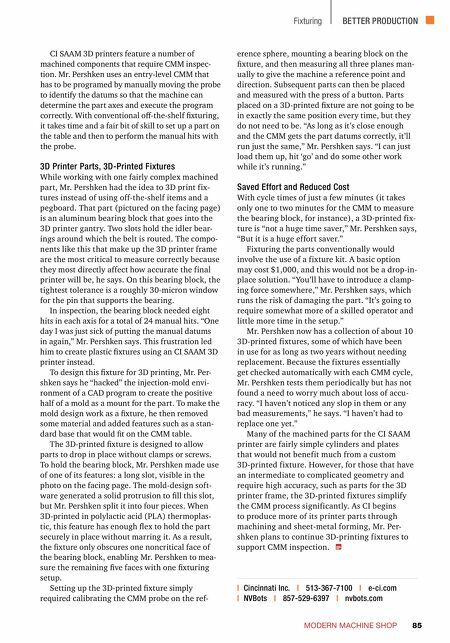 PROBLEM CMM inspection for complex parts took too much effort and time to set up SOLUTION Low-cost 3D-printed fixtures enable parts to drop in place RESULTS Faster, more automated inspection requires less operator time and effort STEPHANIE HENDRIXSON | CONTRIBUTOR CI quality engineer James Pershken used the mold design environment of a CAD program for the initial design of this 3D-printed fixture. He then modified the outcome by adding a standard base to fit the CMM table and splitting the protrusion on the top into four segments to allow some flex in holding the part. Photo: Cincinnati Inc.